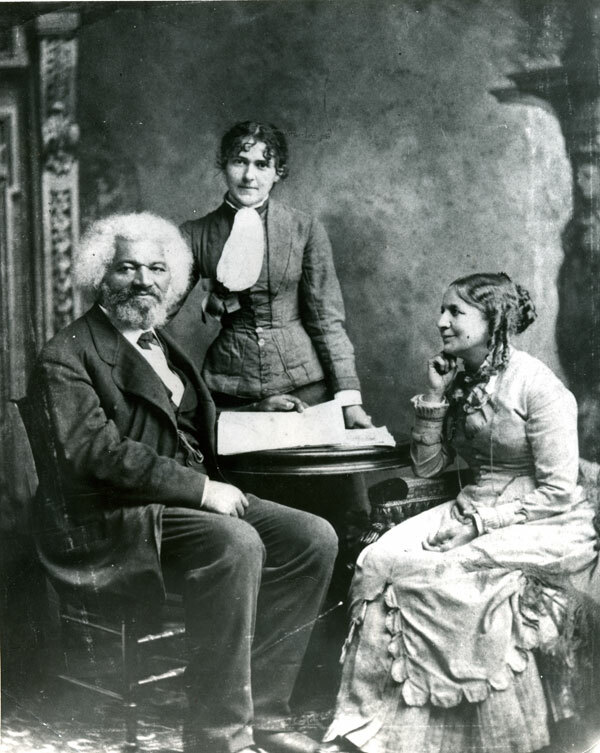 Frederick Douglass, himself of mixed race, with his second wife Helen Pitt Douglass, and their neice Eva. The strength and flaw of an immigrant society is its heterogeneity. The societies that sprouted across the American continent were not one-note masses of people, but rather a chorus of different voices that, for good or ill, must learn to live together. For the most part, this mix of people has been a boon to the economic, social and cultural progress of our country. Unfortunately, in the United States, the concept of races—and their “inherent” differences—has led to an uneasy existence. Different people can work together, live side-by-side, play together. Yet romantic relationships and racial “mixing” was far too often considered taboo. Yet according to Gary Nash, history professor at UCLA and a friend here at the Neighborhood, mixed-race relationships have a long history in America—and just as long a history of fighting for acceptance in a society preoccupied with racial purity. Like a previous book of his I reviewed, Professor Nash’s Forbidden Love: The Hidden History of Mixed-Race America offers a window into a world most Americans know little about. In this case, it is the often submerged undercurrent of multiracial family relationships. Nash paints a wide swath, starting with Pocohantas and ending in the multiracial heritage of our current President. Along the way, by identifying the lives of extraordinary mixed-race Americans, he shows the currents of race and racial identity that have prevailed in this country. Nash writes that the early history of the United States showed great promise for an interracial society, or at least one where race was less relevant than it would become centuries later. Yet due to the settler nature of North America—as opposed to the conquistador/exploitation model of Central and South America—the United States would populate itself with whole families who saw survival, especially ethnic/racial purity, as paramount to their existence. This obsession with racial purity would prevail well into the first half of the 20th century. It dictated how white America would deal with millions of Africans, once enslaved and later as free persons. It also determined the relationship between European settlement and Native Americans who predated them on this continent. Finally, the need for racial purity would affect how America received millions of immigrants from Europe, Asia and Latin America. Nash’s choice of subjects covers many ethnic groups and various periods of American history. He starts with Pocohantas’ marriage to the Virginia planter John Rolfe, and also includes maritime entrepreneur Paul Cuffe, the Healy family (also discussed in a previous post), Elizabeth Hulme, Peggy Rusk, and of course Eldrick “Tiger” Woods. In each, their lives are juxtaposed with the rising and ebbing tide of racial rigidity and consciousness in this country, culminating in the election of a multiracial President in 2008. One particular area that Nash sheds light on is the 18th century Mexican paintings known as “casta” paintings, and how they reflect racial mixture and hierarchy in Spanish America. These didactic paintings demonstrate the nomenclature of the union of persons of different racial makeup, i.e. a Spaniard and a black woman make a mulatto; a Spaniard and a native woman make a mestizo, etc. I remember seeing something similar in a textbook on a visit to Ecuador, yet I was astonished at the bewildering permutations—and labels—that categorized the racial makeup of colonial Mexico. “The offspring of mixed-race marriages could expect a life of discrimination and thwarted ambition. And those with African ancestry faced more limited chances than those with Indian bloodlines. Above all, Spanish blood counted the most.” ~ Gary Nash, in Forbidden Love, Revised Edition, page 48. Unlike his last book we reviewed, The Unknown American Revolution, Forbidden Love makes a remarkably seamless addition to a high school classroom syllabus. This is largely due to its imprimatur, the National Center for History in the Schools, of which Professor Nash is director. NCHS works to connect academic scholarship in history with classroom instruction at all grade levels. In the case of Forbidden Love, the book was revised from its original 1999 version to both add a modern prospective and to make it more suitable for the classroom. Although the book bursts with the hefty research worthy of an academic tome, its tone, vocabulary and short length make this material easily accessible to high schoolers. Even more impressive are the discussion questions located near the end. Each chapter contains these useful questions to continue discussion and to offer differentiation for various student groups. In the multi-racial populations of students in America, research and biographies like those found in Forbidden Love are more crucial than ever. Many cities have populations where racial intermingling has been the norm for centuries, and are now coming into contact with American populations where interracial acceptance has been halting, at best. People like Barack Obama, Tiger Woods, etc. are demystifying what it means to be multiracial in America. As Professor Nash shows, Americans have been mixing together long before they gained acceptance in the wider society. Race, says Nash, is an artificial categorization that has no basis in science. It should, therefore, be natural for humans to accept when races mix and procreate. It’s a shame it took so long to reach that acceptance.